My second track is ready for testing. Not sure there won't be shortcuts... not sure at all. Sometimes I get a lag and sometimes I can do 4 rounds without any trouble so I'm not really sure if there is a problem with the track itself or my pc. Checkpoint 6 is hard to find. My first lap was 7:07, second was 4:40 and last was 4:04. No lag at all here. I'll have a few more notes later. 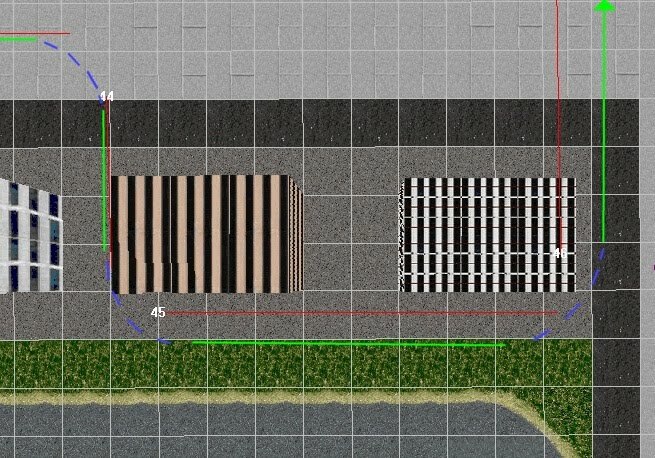 * Course segments should be smaller and not that close to objects/ground boxes, to avoid problems with computer trucks. The green line is an example. * Buildings (Ground Boxes) should have their top/bottom faces properly painted. 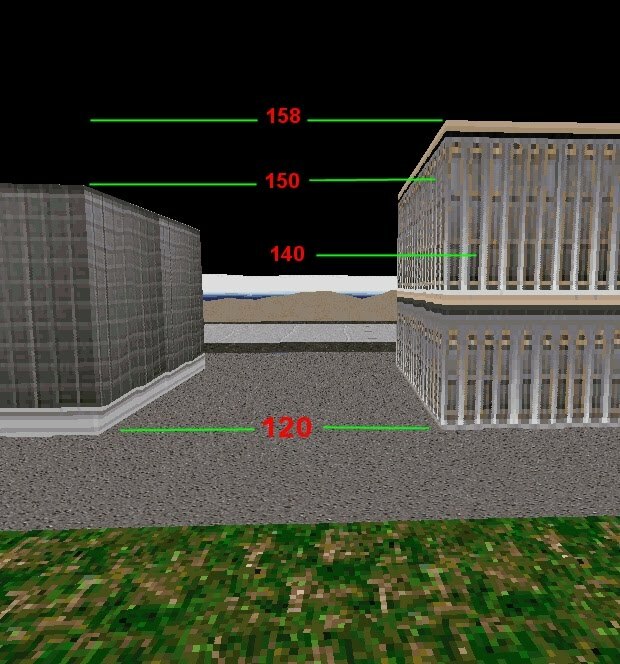 * Ground boxes painted with building texures with 2 floors should not have an altitude +~20. Since the base (bottom) ground box altitude in that groundbox is 120, the altitude should not reach ~140. (At least, that's my standard with my city tracks) This will keep the track a little bit more realistic, when it comes to City tracks. Well, I didn't think the top of the buildings would matter because you don't see it in the game anyway. But you're right, it looks a bit strange. I have also altered the course segments. Btw... nice building textures you've made! There weren't enough of those Is it ok if I use some? >Well, I didn't think the top of the buildings would matter because you don't see it in the game anyway. But you see them on Trackview. >Is it ok if I use some? Technicaly this isn't a problem at all, but concider spreading the cp markers apart a bit more. I think they should span the width of the roadway. Good job, it's a fun track! However, finding where you're supposed to go is very difficult between CPs 5 and 8, and again between 17 and 19. The city needs some more signage just for direction. CP 7 could use an arrow pointing to the inside of the post. I also think that the "floating arrows" might be better served by a larger sign over the track, my drivers won't let me do anti-aliasing, and therefore I can't really see it until its too late. Course ? What course ? See my notes above, and cale's too. The course should be visually obvious without the map, shouldn't it? Maybe? The course should be visually obvious without the map, shouldn't it? Maybe? I'll make the course more obvious.